Rinse the celery well and remove the tough outer stalks. Cut off the root end but keep the whole head together. Thinly slice the head of celery, cutting on the diagonal. Use a sharp knife to get clean cuts. 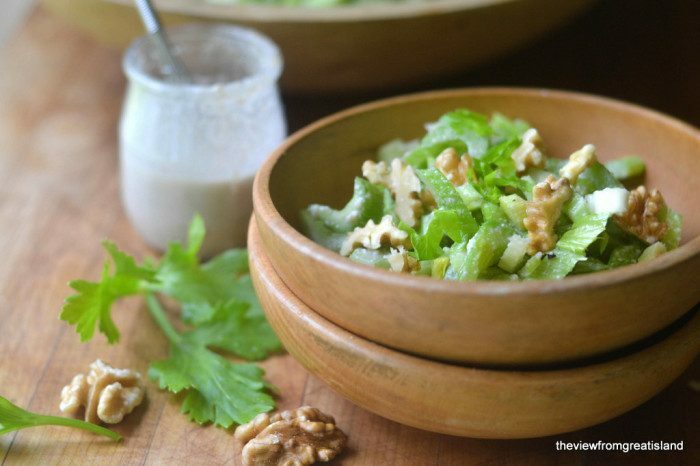 To make the dressing, put 1/4 cup of the nuts in a small 4-cup food processor. Process them until finely ground, you will have to scrape down the sides once or twice. Add the vinegar and process again. Then, while the machine is running, drizzle in the oil until you have an emulsion. Stop the machine and taste as you go until you get a balance of acidity that appeals to you. Toss the celery with enough dressing to coat lightly, and then put in the refrigerator for an hour or so. When ready to serve, top the salad more rough chopped walnuts and more dressing.